Julie Southwell has been authorized to teach Ashtanga yoga by Manju Pattabhi Jois and is a longtime student and teacher in the tradition as pioneered and taught by Sri K. Pattabhi Jois in Mysore, India. She is the director of the Bend Ashtanga Yoga School in Bend, Oregon. Julie started practicing Ashtanga in 1995 as a centering tool for her international cross-country ski racing career. The yoga had a profound influence on many levels. She started sharing the method in 1998 after a mentorship with her first teacher in Fairbanks, Alaska, Teri Viereck. She has been teaching Ashtanga yoga consistently ever since. In 2004 she began regular trips to Mysore, India to study with Sri K. Pattabhi Jois and family and continues to study in-depth with his son Manju Pattabhi Jois after meeting him in Mysore in 2004. 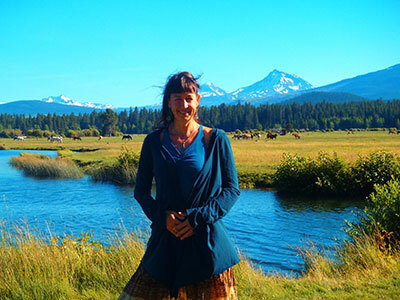 She has hosted Manju in her city of Bend, Oregon for workshops and teacher trainings and continues her devotion to the Jois method of teaching and practicing yoga in the individual-based "Mysore style." In the U.S., Julie has practiced regularly, including teacher trainings, with senior teachers David Garrigues (since 2002) and Nancy Gilgoff (since 2012). In addition to her experience practicing and teaching Ashtanga yoga, she has a B.S. in kinesiology from University of Colorado and has been a licensed massage therapist since 1995. She is a professional musician, a violinist, with a particular interest in India's classical music, as well as Sanskrit chanting and the singing of kirtan and bhajans. Julie's unique blend of skills and talents combine with a light-hearted and loving attitude towards the practice, her students and the teaching of yoga and all things.